Milwaukee’s Croatian community dates to the first decade of the twentieth century. United States Census figures indicate that in 1910, over 3,000 Croatians and Serbs, identified by mother tongue and grouped together at that point, lived in the city. Despite their rural backgrounds, early Croatian Milwaukeeans worked in the city’s industrial sector in the city and West Allis. In 1917, the Croatian community in Milwaukee founded Sacred Heart Croatian Parish, part of the Roman Catholic Archdiocese of Milwaukee, on the city’s north side at Seventh and Galena. A second parish, St. Augustine, was founded in West Allis in the late 1920s. With the collapse of the Austro-Hungarian Empire at the end of World War I, Croatia became part of the new nation of Yugoslavia. It was established as a separate Nazi puppet state during the Second World War and remained part of Communist Yugoslavia from the end of World War II until 1991, when it became an independent republic. Immigration restriction in the US in the 1920s halted further immigration to the U.S. until after World War II, when displaced persons of Croatian descent migrated to Milwaukee, renewing the local community. In the last decades of the twentieth century, the area’s small Croatian community continued to thrive, as some 5,000 to 8,000 people in the metro area reported Croatian ancestry in the census. Other estimates placed the count as high as 12,000. 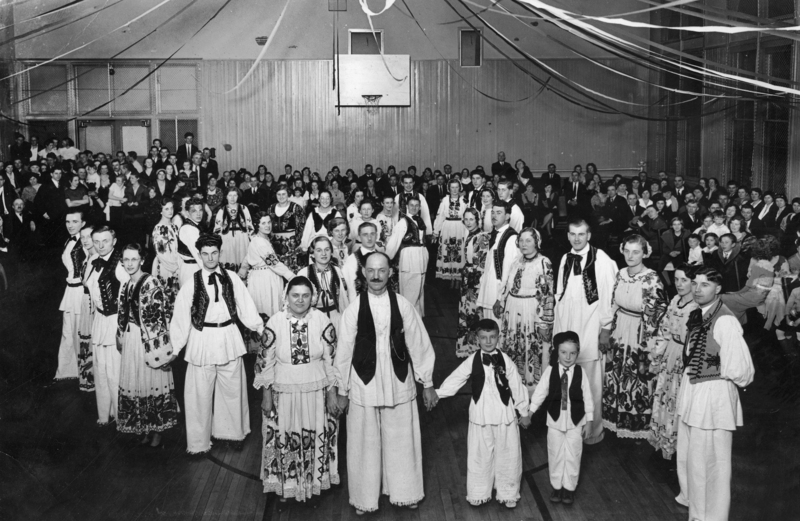 Most ethnic Croatians practice Roman Catholicism, and churches have been an important point of community for Croatians in the Milwaukee metropolitan area. Having operated since 1917 and in its current location since 1949, Sacred Heart Parish on the city’s west side continues to minister to Croatian Catholics, with services in English and Croatian. St. Augustine Parish, also part of the Roman Catholic Archdiocese of Milwaukee, remains located in West Allis. Sacred Heart does offer services in Croatian and has helped the continuance of Croatian ethnicity in Milwaukee. But the parish system of the Catholic Church, which determines church membership based upon residence, ensures that the churches cater to many non-Croatians and has encouraged interactions across ethnic lines. Some scholars of Milwaukee’s Croatian population have argued that this mingling at once maintains Croatian identity while causing cultural sharing and assimilation. In addition to churches, the area’s Croatians operate a soccer club, the Croatian Eagles, claimed to be the oldest soccer club in North America. This organization provides youth and adults the opportunity to develop friendships with one another and compete against other soccer clubs. The Croatian Eagles play their home matches at Croatian Park, in suburban Franklin. ^ U.S. Bureau of the Census, Mother Tongue & Mother’s Mother Tongue—Serbo-Croatian, 1910-1970, tabulated at http://www.ipums.org; “Sacred Heart Croatian,” Archdiocese of Milwaukee website, last accessed February 20, 2012; Charles A. Ward, “The Serbian and Croatian Communities in Milwaukee,” General Linguistics 16, no. 2/3 (1976): 154-156. ^ Kazimierz J. Zaniewski and Carol J. Rosen, The Atlas of Ethnic Diversity in Wisconsin (Madison, WI: University of Wisconsin Press, 1998), 86. ^ “Croatia,” United States Department of State, last accessed February 20, 2012; “Sacred Heart Croatian,” Archdiocese of Milwaukee, last accessed February 20, 2012; “St. Augustine,” Archdiocese of Milwaukee website, last accessed February 20, 2012; Ward, “The Serbian and Croatian Communities in Milwaukee,” 155. ^ Ward, “The Serbian and Croatian Communities in Milwaukee,” 157-158. ^ “Croatian Eagles,” Croatian Eagles Soccer Club website, last accessed February 20, 2012, now available at http://www.croatianeagles.com/, accessed July 14, 2017. Ward, Charles A. “The Serbian and Croatian Communities in Milwaukee.” General Linguistics 16, no. 2/3 (1976): 151-165.